I won’t get into the intricacies of Biss’s stunning and meandering exploration (I recommend you read it yourself) but what stays with me today is Biss’s call to examine the political nature of fear. How does fear cleave and shrink our collective imaginations? In the face of monstrous scaremongering, how do we countervail? Can we (those of relative power and privilege) avoid the urge to withdraw? Can we fend off the urge to indulge in our own fear impulses, e.g. fortressing ourselves and our kin from the threats and horror of the world—a survivalist approach that can be marshaled to rationalize THE MOST privileged and anti-communal actions? Can we heed the need for communal care and responsibility—cultivating a more generative and generous survivalism? How on earth (in these unevenly threatening times) do we frame our interactions with the world? I don’t have the answer. But I do have a good picture book. It’s called The Moomins and The Great Flood. It was originally published in Finland in 1945 by Tove Jansson and I think it offers one possible scenario—or, even, a revolutionary retort to fear. Briefly: the Moomins are refugees from human civilization and their father Moominpappa has disappeared. 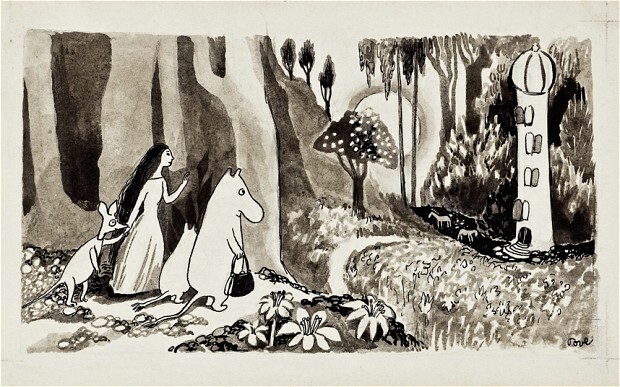 Loaded with fear and worry, Moominmamma and Moomintroll set off to look for him. The family bond that unites the Moomin pair is intensely loving, but it is also open-ended. Disparate creatures, estranged from the world and brought together by the devastation of a great flood, are welcomed into the fold. Sniff joins the family. Tulippa finds a home in a lighthouse, guiding other lost creatures to safety. The Hemulens and Hattifatteners are also represented as kindred spirits in the Moomin world. 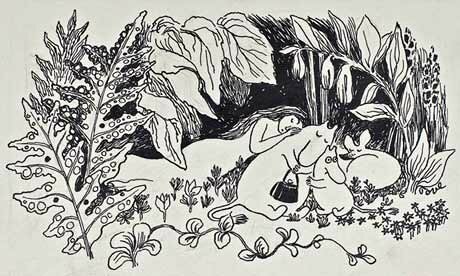 If there is a ‘take-away’ from the Moomin stories it is that closed system thinking cannot help us. Rather than retreat into a private world of grief or flummoxed passivity, we need to find ways of treating our vulnerability as an open window. 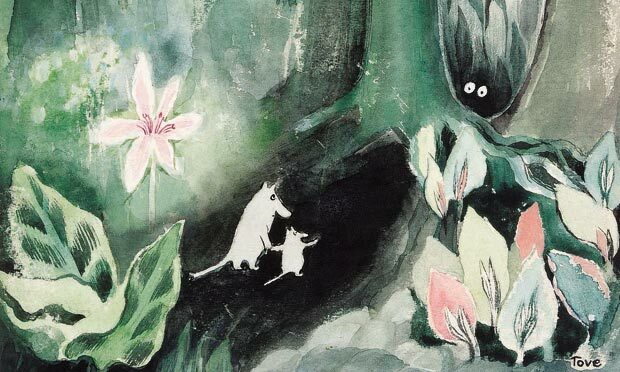 Faced with ecological disasters, brutal wars, and the threat of destruction looming over the future of their world, the Moomins practice an insistent openness. We must too. I have great faith in my community of co-creators. I believe wholeheartedly in the power of art to reenvision the possible. To conceive of the world “as if it were other than it is,” Amitav Ghosh reminds us, is the great project of fiction. It is also the great project of reaching toward a common world (one with proper shelter, healthcare, food security, education, and climate stabilization for all!) As writers we have the opportunity to fashion new scenarios and fresh pathways. We have the power to to enter the dark woods of a reimagined community, a community that constantly tests and reconfigures the range of ‘us’. I’m going to keep the Moomins close at hand. I want to surround myself with stories (and movements) that model interdependence; that nurture human and non-human diversity; that foster a sense of welfare beyond biological kinship and self-interest. “What will we do with our fear?” Where will we go? How will we enact our hope? We’re implicated in this mess differently, but we can choose to be in it, fighting and flourishing, together.